You wake startled in the middle of the night, terrified from whatever nightmare you were just experiencing. You try to sit up, but discover that you can't move your body. You try turning your head in your wife's direction, hoping to get her attention, but quickly realize that not only can you not move any part of your body, but you can't even speak. Not so much as a whispered plea to your wife, a desperate entreaty to get her attention so that she can rouse you from this terrifying state. You feel a presence in the room, an ominous shadow in the corner, at the foot of the bed, or even sitting upon your chest. You can't breathe from the crushing weight of some invisible force pinning you down. Your whole body is alive with an electric buzz as if you're hooked up to a string of car batteries. You strain with all your might against the paralysis, trying to fight against the weight on your chest, but to no avail. You try to fall back asleep, but the electric hum builds as if every nerve in your body is pulled wire-tight and begins to sing louder and louder to a building crescendo of intolerable proportions. You think, this is it. I'm going to have a heart attack. There's nothing you can do. You're stuck–fighting between a futile attempt to move against unseen forces keeping you immobile, and the fear of falling back asleep to possibly never wake again. This is sleep paralysis–a waking nightmare. The above description of what it's like to "wake-up" in the throes of sleep paralysis is based on my own personal experience with the phenomena. When I began working at The Alaska Sleep Clinic, my first line of questions pertained to "what is called when I wake from sleep, but can't move for a few minutes?" I then began describing my symptoms, and was finally given a name to my experiences. I was relieved (in a way) to discover that I wasn't alone in my suffering. 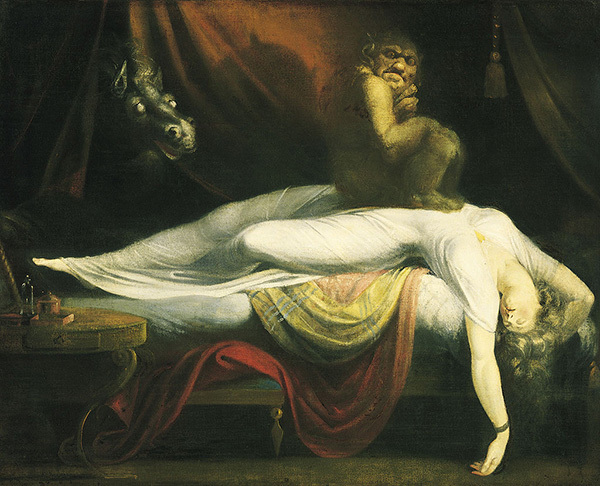 Many people throughout the course of history have reported similar accounts of sleep paralysis. While accounts may differ to varying degrees, there are some common threads to most stories: waking without being able to move any muscle but the eyes, a sense of a threatening presence in the room (often described as a shadowy figure), a feeling of a large weight on one's chest, and an overpowering sense of dread and helplessness. As one is falling asleep (hypnagogic or predormital form). In most cases of sleep paralysis occurring as one is first falling to sleep, the condition is often associated with the sleep disorder narcolepsy. During this time, as the body relaxes and begins to enter the stages of sleep, the mind remains conscious, aware that sleep is occurring, but unable to react through movement or speech. as one is waking from sleep (hypnopomic or postdormital form). This is the most common form of sleep paralysis without other sleep disorder comorbidities. During sleep our bodies go through five 90-minute sleep cycles alternating between REM (rapid eye movement) and NREM (non-rapid eye movement). You spend approximately 75% of your sleep time in the 4 stages of NREM in which the body relaxes, repairs and regenerates tissues, builds muscles and bones, and strengthens the immune system. 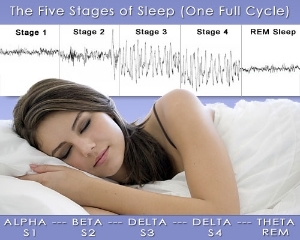 During REM sleep brain activity increases and most people experience dreaming. During this time, voluntary muscles become paralyzed (atonia) as a response to keep our bodies from acting out our dreams, and possibly harming ourselves or our bedpartners. Sleep paralysis occurs when people awaken before the REM stage has been completed, leaving them conscious of their surroundings but still unable to move or speak until the REM cycle has been completed. The inability to move often leaves the person in a vulnerable state leading to them becoming panicked as a response to their vulnerable condition. During these episodes many sufferers of sleep paralysis experience auditory and visual hallucinations, which are manifested from the brain activity still being in REM sleep (where dreaming occurs). The panic from feeling vulnerable caused by paralysis coinciding with the sleep cycle still being in REM stage, attributes to the manifestations of threatening hallucinations. Sleep paralysis can affect both men and women of any age with the average age of first occurence between 14-17 years old and higher likelihood of recurrent episodes in one's 20's and 30's. Estimates of how many people have it vary widely from 5% to 40%. Other studies suggest that at least 50% of people will experience sleep paralysis at least once in their lifetime. People who sleep on their back are more likely to experience sleep paralysis than sleeping in other positions. A disruption of normal sleep patterns. Mental conditions such as stress or bipolar disorder. Use of certain medications such as those prescribed to treat ADHD. A symptom of other sleep disorders such as narcolepsy. More than likely your sleep paralysis is linked to poor sleeping habits. Therefore, try making sure you get enough sleep every night. And keep your sleep regular, meaning, go to sleep at approximately the same time every night and wake at the same time every morning. 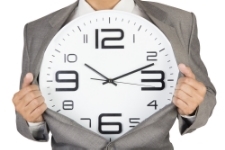 For more information on how to "set your body clock" click here. Treat any mental health issues such as stress or bipolar disorder. Get evaluated by your primary care physician or a sleep specialist to see if your sleep paralysis is linked to any other sleep disorders (such as narcolepsy), or medical disorders. If your symptoms are severe you may be prescribed antidepressant medications that may help regulate your sleep cycles. Well there you have it, the symptoms, causes, & treatments for sleep paralysis. On a personal note, just having a scientific explanation to the disorder I was experiencing really helped aalleviate my fears for when I would experience episodes. The knowledge that although the events were indeed terrifying, knowing that they were relatively harmless helped me get through later episodes. I also noticed that since I started keeping a regular sleep schedule, I haven't had an episode in a very long time. However, if you feel that your symptoms could possibly be linked to an underlying sleeping disorder, feel free to contact The Alaska Sleep Clinic for free 10 minute phone consultation, and we'll help you determine whether or not a sleep study may be right for you.